In these last sunny days of autumn on the south coast of England, I’m staring at plants still laden with tomatoes as well as shelves full of picked tomatoes, and my freezer is already heaving with homemade tomato soup and tomato & basil pasta sauce (enough to see me through any winter / brexit / zombie apocalypse that may be upon us). And I don’t like waste. So it looks like it’s time to get a big pot of water on to boil for operation ‘blanch, peel and freeze’ - which is a lot less faff than it sounds to be honest, because you don’t actually ‘peel’ these fruits, you just help the skin slide off. It’s a great way to preserve and store tomatoes for up to a year, to use in any recipe where you would normally use canned tomatoes or fresh ripe ones - curries, chillies, casseroles, ratatouille etc. I use a simplified, unfussy version of this method. You don’t need ice cubes, and you don’t need specialist equipment - just some basic stuff you may already have in your kitchen: a big pot or pan; a couple of baking trays; a large (preferably slatted) spoon; a small knife; and some freezer bags or tubs. Pick and rinse / wash the tomatoes. I wash them in a sink of tap water to remove the worst of the air pollution which is, unfortunately, a fact of urban life in the UK; and that’s also a good reason for peeling the tomatoes if you’re worried about pollutants. Cut out the stem scar, and cut a small X on the bottom of each tomato - the blanching process will start to do the peeling for you from these cuts at both the top and bottom of the tomato. Using a large slatted spoon, add tomatoes about half a dozen at a time to boiling water, blanche for 30-60 seconds, remove and place on a baking tray or other receptacle to cool down. You can carry on cutting, blanching and cooling as you go along, and should be able to get through quite a few kilos in an hour. Once the tomatoes are ‘peeled’ - truthfully, the skin will just slide off - you can freeze them in any freezer-proof container. 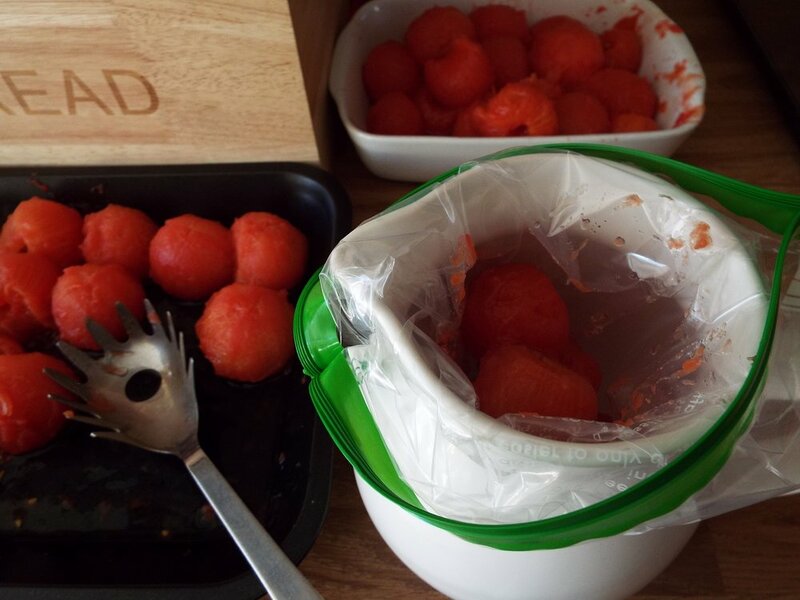 I use re-usable freezer bags, as they are easier than tubs to manipulate into pretty crowded freezer drawers (often a problem at this time of year). 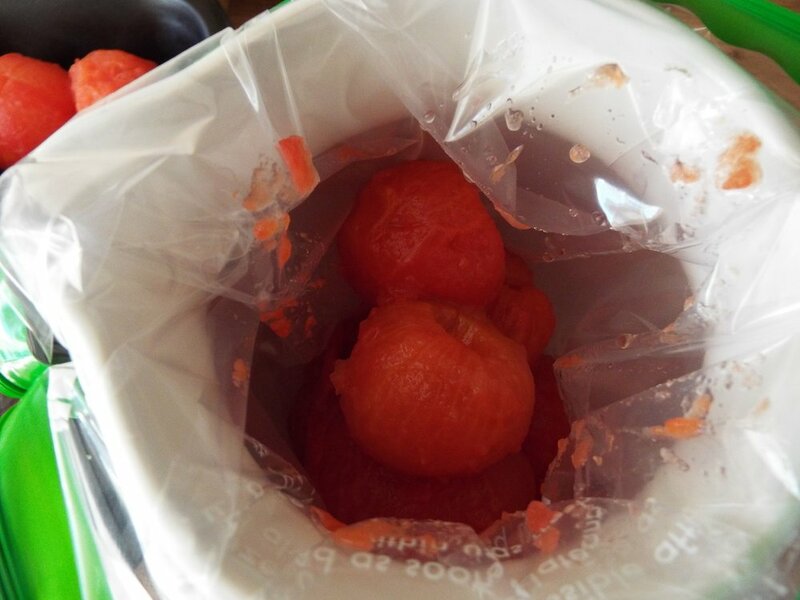 Getting the tomatoes into flat freezer bags doesn’t have to be messy - put the bag into a jar, bowl or similar, open it up at the top, and spoon in the tomatoes. If you want to keep the juice that’s formed in the baking tray, share that out among the bags. I put about six medium to large tomatoes in each bag, the equivalent of a can of tomatoes. Gently squeeze out the excess air from the bag and zip closed. Freeze straight away.